On October 6, The Holy Land Experience -- a Christian-inspired theme park in Orlando, Fla. -- was completely overrun by more than 7,000 visitors. Shortly after opening that day, it hit its 1,700-person limit and began turning people away. Meanwhile, nearby highway I-4 was transformed into a parking lot as eager park-goers lined up for admittance. Holy Land employees stationed outside the park's gates, started handing out rain checks and eventually ran out. At least one would-be pilgrim echoed Jesus' parents, plaintively asking "Do you have room for one more?" One might wonder why so many people desperately sought entrance to a park whose central features are a re-enactment of Jesus' crucifixion, a 1200-square-foot model of Biblical Jerusalem, and a full-sized reproduction of the Great Temple. After all, in Orlando, a park that has no rides, features minimal robotic wizardry and focuses on a series of attractions designed to evoke the Jerusalem of Jesus' day is a fairly tough sell. While one might suspect a mass influx of evangelical vacationers or the sudden conversion of much of central Florida, the truth was far more prosaic: On October 6, the Holy Land Experience offered free admission. In 2006, following a four-year fight with Orange County Property Appraiser Bill Donegan, the theme park successfully sued for tax-exempt status as a religious museum. The only catch was that it had to waive its $35 admission price for at least one day a year. In 2007 and 2008, the free days passed with minimal fanfare, as they were barely publicized by Trinity Broadcasting Network, the park's owner. Following protests from local papers, however, the Holy Land Experience finally announced its free day, after which it was beset with a stream of visitors that hearkened back to Moses' Biblical plagues. 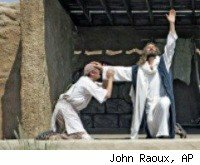 An actor portrays Jesus during a re-enactment of the Crucifixion at the Holy Land Experience. Click here to see more photos. Historically, religious theme parks have been a tough sell, as most American vacationers seem to want to keep their church and their recreation strictly separated. The big exception was Jim and Tammy Faye Bakker's Heritage USA; in the mid-1980's, its combination of rides and religion made it one of the top vacation destinations in the country. Of course, the fact that it was classed as a non-taxable religious organization didn't hurt, and Bakker famously used the park as a fundraiser, selling $1,000 vacation packages in the park's Heritage Towers hotel to 165,000 people before he was ousted from his ministry. When his supporters later sued for their funds, they received $6.54 each. Heritage USA eventually lost its tax-deductible standing and began a downward slide into disuse and neglect as it passed from one religious group to another. Currently, Morning Star Ministries of Charlotte, N.C., owns large portions of the park. It has renovated the Heritage Grand Hotel, and -- in a move that is painfully reminiscent of the Bakkers -- is selling room sponsorships for $5,000 apiece. Their website states that "Just as all who joined Ezra to rebuild the temple in Jerusalem were named in eternal canon Scripture, your name [...] will be permanently fixed by the door of the room you choose." The site goes on to tell supporters that, in addition to cash, they can donate "stocks, appreciated assets, IRA gifts, and property." The Holy Land Experience seems to be experiencing some difficulty with finding its place on the ministry/investment continuum. Created by Marvin Rosenthal, a Jewish-born Baptist minister, the park was designed to immerse visitors in Jesus' Jerusalem and, not incidentally, in the Judaic culture that underlies the New Testament. While praiseworthy, this goal was not particularly lucrative: After operating at a deficit in 2005 and 2006, the park was purchased by TBN, which quickly turned around its finances. By the end of 2007, it was operating at a profit. According to TBN, the Holy Land Experience does not fully cover the cost of the organization's ministries. However, this has not kept the religious network from expanding, both at the Holy Land site and in a second religious theme park, Trinity Music City. Formerly the home of country music singer Conway Twitty, the Nashville complex offers live music shows, a re-creation of a street in Jerusalem, the "Gold, Frankincense and Myrrh Bible Book Store," and a restaurant, "The Solid Rock Bistro." Like The Holy Land Experience, Trinity Music City is tax exempt. Although TBN reports that most of its profits support charitable activities, it is hard to verify this claim. Ministry Watch, a nonprofit site that monitors the finances of religious organizations, has given the network an "F" for transparency, stating that TBN delayed release of its financial information, failed to provide its donors with opportunities to ask questions, did not supply "consolidated financial statements," and its press releases "seemed intentionally designed to mislead donors." According to Ministry Watch, TBN has assets totaling over $800 million, and has a net income of almost $60 million per year. According to Colby May, TBN's communications counsel, "TBN is fully transparent, moreso than virtually any other religious organization. It files all its 990s and all this information is available online. It fully complies with all requirements of the law." Even so, transparency questions remain. Part of the problem seems to be that TBN's board of directors is controlled by the Crouch family, whose members draw salaries totaling more than $900,000 per year. Because of this lack of board independence, TBN is not eligible to join the Evangelical Council for Financial Accountability, a ministry self-policing group. It is worth remembering that, while questions remain about TBN, not all religious charities can be painted with the same brush. As Ministry Watch notes, many other religious groups are far more open about their finances, programs and leadership. That having been said, TBN seems to be a very profitable business; too bad its business is ostensibly not for profit.